How far would you drive to save thousands? At our Ford dealership in Montevideo, MN, you can enjoy a vast inventory of new, used and Certified Pre-Owned Ford vehicles at competitive prices. To better accommodate your busy lifestyle, we offer free delivery of new and used Ford models so that you can enjoy your new or new-to-you vehicle right from your home or office. Schedule to test-drive new Ford models like the Ford Escape or impressive Ford F-150, or browse our pre-owned selection of Ford Focus and Fusion models. We're confident you'll be happy with your choice no matter what you decide to buy or lease. 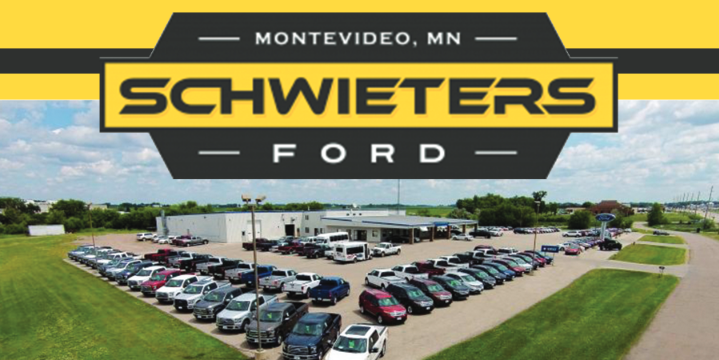 Schwieters Ford of Montevideo is your one-stop shop for Ford sales, service and financing. Our Ford experts are standing by to answer any questions you may have, and if you're in need of service, maintenance or repairs we can handle that, too. Our Ford service center offers flexible hours and stocks a wide variety of OEM Ford parts, ensuring that the right components are going into your vehicle. Whether you want to drop your vehicle off for maintenance or browse our inventory for your next Ford, we're confident you'll be happy with your experience at our dealership! Need More Reasons to Buy from Schwieters Ford of Montevideo? Our Ford service center offers semi-synthetic oil changes for just $16.99, a price that you'll find is hard to beat! You can shop with peace of mind thanks to our price promise guarantee. If we are unable to beat a competitor price, we'll offer an additional $1,000. If you trade your Ford into us within 60 days of a repair being made, we'll refund up to $1,000 of the repair. Our Ford service center repairs makes and models of all kinds, making us your perfect destination regardless of what you drive. You can trust that the technicians in our service center know their stuff. In fact, they've been recognized by Ford for the quality of work that they've done! We believe in getting involved and giving back to the community. When you do business with us, you're helping out your community as well!